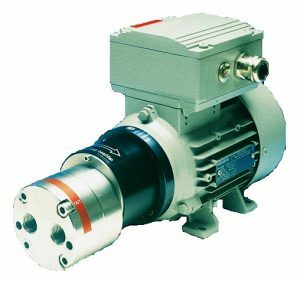 With its magnetic drive gear pump Gather offers an important product for transfer and metering applications. Utmost manufacturing precision, a variety of materials as well as non-pulsating pump operating characteristics are indespensible product design prerequisites. Variable-speed pump drives are available to satisfy all application needs. The magnetic coupling of the gear pump enables the complete pump to be hermetically sealed so that when appropriate materials have been selected maximum safety can be warranted when hazardous liquids are to be handled. In the event of overloads of the pump the magnetic coupling decouples. The drives conform to VDE specifications and are available with any protection system and with any explosion proof protection. Gather magnetic drive gear pumps offer capacities between 0.06 l/h and 1,500 l/h (.0158 to 396 gph), and are available in 2 sizes and 7 tooth widths. The pump can be tailored to customer requirements and, thus, enable the handling of nearly all media including non-lubricating liquids with temperatures from -60°C to +315°C. The pumps are hermetically sealed and can also be operated under vacuum. Depending on the liquid handled, the differential pressure is 15 bar maximum. For a viscosity between 0.1 and 2,000 mPa s the entire speed range is available: 10 - 6,000 RPM. A pumping test will be required for viscocities between 2,000 and 10,000 mPa s. The main advantage of the gear pump is that it delivers a non-pulsating media stream. Please contact Chemac for complete details on Gather Magnetic Gear Pumps, or download our handy inquiry form (in PDF format), fill it out and fax or e-mail it to us for a quotation (requires Adobe Acrobat Reader).